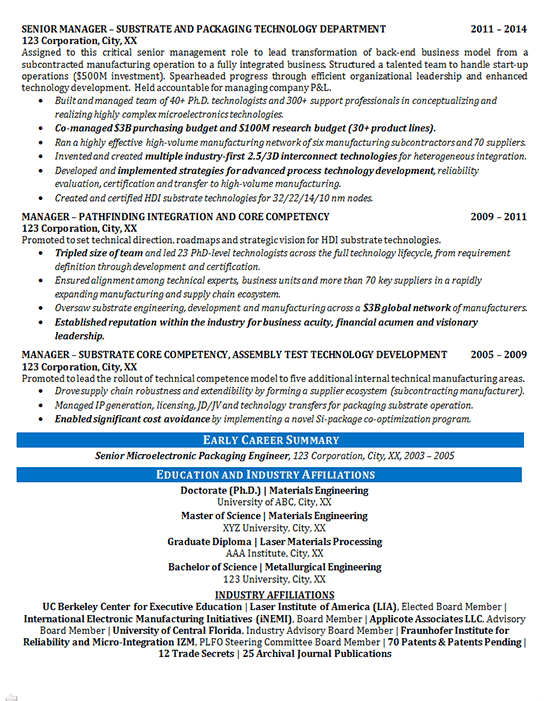 This resume was created for a Technology Integration Director that is interested in simply seeing what jobs are out there for him to explore. The high level IT manager had a wealth of strong professional experience, industry affiliations and relevant education degrees. The challenge was to properly highlight all of these aspects while keeping the resume to two pages. To help with this goal, an introductory paragraph and Summary of Qualification section was used to highlight a lot of key strengths and accomplishments without taking up much space. Following these sections came his professional experience. Since the job seeker had a lot of relevant experience, it was decided to write the most critical bullet points in bold so that the reader would be drawn to these high-impact statements. This protects again prospective employers skimming a resume and missing important information. Finally, each of the four degrees were listed as well as industry affiliations . This demonstrates how well-versed and accomplished this client is in their field. 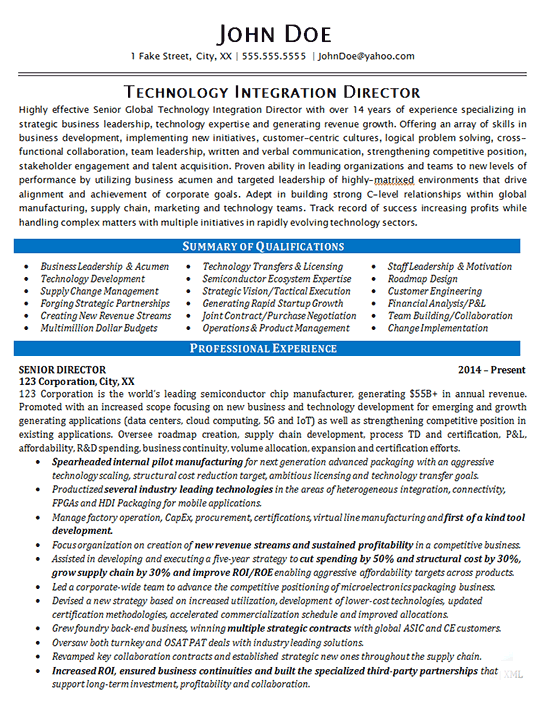 Highly effective Senior Global Technology Integration Director with over 14 years of experience specializing in strategic business leadership, technology expertise and generating revenue growth. Offering an array of skills in business development, implementing new initiatives, customer-centric cultures, logical problem solving, cross-functional collaboration, team leadership, written and verbal communication, strengthening competitive position, stakeholder engagement and talent acquisition. Proven ability in leading organizations and teams to new levels of performance by utilizing business acumen and targeted leadership of highly-matrixed environments that drive alignment and achievement of corporate goals. Adept in building strong C-level relationships within global manufacturing, supply chain, marketing and technology teams. Track record of success increasing profits while handling complex matters with multiple initiatives in rapidly evolving technology sectors. Spearheaded internal pilot manufacturing for next generation advanced packaging with an aggressive technology scaling, structural cost reduction target, ambitious licensing and technology transfer goals. Productized several industry leading technologies in the areas of heterogeneous integration, connectivity, FPGAs and HDI Packaging for mobile applications. Manage factory operation, CapEx, procurement, certifications, virtual line manufacturing and first of a kind tool development. Focus organization on creation of new revenue streams and sustained profitability in a competitive business. Assisted in developing and executing a five-year strategy to cut spending by 50% and structural cost by 30%, grow supply chain by 30% and improve ROI/ROE enabling aggressive affordability targets across products. Led a corporate-wide team to advance the competitive positioning of microelectronics packaging business. Devised a new strategy based on increased utilization, development of lower-cost technologies, updated certification methodologies, accelerated commercialization schedule and improved allocations. Grew foundry back-end business, winning multiple strategic contracts with global ASIC and CE customers. Oversaw both turnkey and OSAT PAT deals with industry leading solutions. Revamped key collaboration contracts and established strategic new ones throughout the supply chain. Increased ROI, ensured business continuities and built the specialized third-party partnerships that support long-term investment, profitability and collaboration.